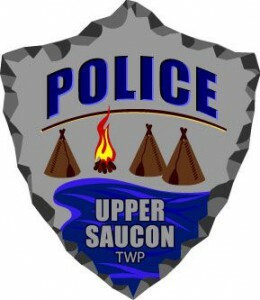 The Upper Saucon Township Police Department operates out of the Township Municipal Building located at 5500 Camp Meeting Road. The Department is comprised of 21 full-time officers, a Police Clerk and a Chief of Police. In addition to 24-hour patrol services and crime investigation, the Department participates in a regional DUI task force, sponsors a local D.A.R.E. program and oversees a community service program for first time juvenile offenders. The DUI task force conducts sobriety checkpoints and roving patrols on area roads that have been known to experience a high level of alcohol related accidents and/or arrests. Area police departments formed the regional task force to raise public awareness of the dangers of drinking and driving. The task force is funded by a grant from the Pennsylvania Department of Transportation. D.A.R.E. stands for Drug Abuse Resistance Education. The D.A.R.E. Officers provide instruction for children attending the Southern Lehigh Middle School and St. Michael’s School in Colesville. This nationally recognized program provides children with the skills they need to avoid involvement in drugs, alcohol and violence. Officers from the Upper Saucon Township Police Department have been providing D.A.R.E. instruction since 1989. Click here to visit the National D.A.R.E. web site. Since 2007 the Upper Saucon Township Police Department partners with the IMPACT Project and the Lehigh County Juvenile Probation Department to provide first time, low-level juvenile offenders an alternative to the juvenile justice system. Local community volunteers, who meet at the township building, give generously of their time to meet with those juveniles identified by the police department as candidates for the program. Without the volunteers the program would not be available. A panel in which County citizens serve on community panels to decide the consequences for a juvenile charged with minor offenses in order to divert these individuals away from the juvenile justice system. The CJP program provides an alternative method for dealing with first-time juvenile offenders who commit low-level, non-violent crimes. This program was created in 1999 by The IMPACT Project, a local private social service agency, and the Lehigh County Juvenile Probation Department. It was originally funded through a grant, but Lehigh County’s Human Services Department now fully funds the program through juvenile probation’s budget. The Pennsylvania Aggressive Driving Enforcement and Education Project (PAADEEP) is a statewide initiative that utilizes crash data to identify aggressive driving locations. High visibility target enforcement, coordinated earned media, public awareness and training are conducted on these roadway to reduce the number of needless aggressive driving injuries and deaths. The partnership is comprised of municipal police departments, the Pennsylvania State Police, PennDOT, the US Department of Transportation and community groups and organizations. Participating Agencies will use Traffic Enforcement Zones, Saturation Patrols, Speed Enforcement Details, Corridor Enforcement, Work Zone Enforcement and Multi-Jurisdictional Patrol strategies to identify and cite aggressive drivers. The PA Aggressive Driving Enforcement and Education Project would like to thank all participating Police Agencies for their commitment to traffic safety. These efforts continue to contribute to the reduction of crashes, injuries and deaths on Pennsylvania roadways. PA Route 309 in Upper Saucon Township has been identified as a target roadway for this program due to the number of accidents that occur along this roadway. 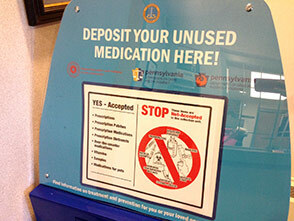 The Upper Saucon Township Police Department is proud to announce the installation of a permanent drop-off box for unused medications. The box is located in the lobby of the Police Dept., and is available for free, anonymous drop-offs Monday – Friday, from 8a-12p and 1p-4p. If you have a feral cat issue, you can contact No Nonsense Neutering of the Lehigh Valley. Their services include a trap-neuter-return program. PLEASE think about adopting an animal in need-you may find your new best friend(s) there. This packet should be completed once you have contacted Upper Saucon Township Police Department and obtained a police report number related to your identity theft case.